Telephone or some called phone, the communicative invention of early 1870s, which allowed users from different geographic locations to conduct conversations via signal transmission cables or other transmission media. The basic structure of telephone involves a microphone and an earphone on the handle part. In the main body of the phone, the dial panel is also indispensable for communicators to access each other. For phone manufacturers, both the functions and the interface design are decisive factors to sales and the satisfaction level of customers. Therefore, a testing model prior to the mass production is necessary for picking out the flaws of functional units or the impropriety of shell. Prototyping is such an industry which enables some fundamental concerns to be solved before the production of final products. For example, the comfort level of touching while the microphone & earphone part is handled, or the thickness and fitness of key presses to the panel parts are important effects of a designed phone. 1. Programming: The design drawing(s) from customer(s) will be analyzed by programmers in computer and transfer to machine recognizable language or commands. The programming stage is the key of the whole manufacturing process, while the design drawing determines whether the programming operation or even the following steps can be processed. To be specific, customers should offer the 3D drawing(s) to manufacturer to produce the prototype(s). 2. 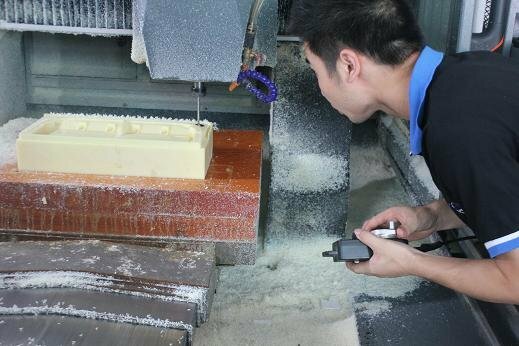 CNC Machining: Programmers import the commands into CNC machine and guide the spindle to designed locations and depths of the material in order to shape a basic profile of the prototype. In this case, the prototype is required to be sectioned into several parts to ensure the inside units like the microphone can be fitted in. 3. Hand-grinding: The first finished CNC parts are of burred edges which demand the hand debarring process to remove them. Apart from this, the surfaces of each part also need to be smoothed by using sand paper or other grinding tools. 4. Painting: Painting is a process of beautifying the prototype. The operator will paint the object with the most suited paint material, painting methods, and related painting tools. The color is also mixed according to the Panton standard. 5. Silk printing: Also called silk-screen which is another post-production finishing technique commonly used to beautify the surface or mark the logo. Basically, it is the process of using a mesh-based stencil to apply ink onto a substrate, whether it be T-shirts, posters, stickers, vinyl, wood, or other material.